mine4miles is a mining simulation game where the object is to mine for as many miles as you can while trying to collect and identify 1,000 unique gems buried in 10 different mine shafts. Place diggers to unearth ore that you collect for coins. Use your coins to add more diggers and dynamite to keep expanding your mine. 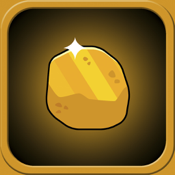 Earn nuggets to hurry up digging, to speed up ore carts and to identify the gems you collect. Collect and identify gems to advance to new levels and mine for different types of ore.
Help the mining community to expand the global mine to more than one billion miles! • 1,000 different quotes and nuggets of wisdom to discover while mining. • Game Center support for Leaderboards and Achievements. • iCloud support for syncing your game to multiple devices. • Play for Free for as long as you like. We hope you enjoy playing mine4miles. NOTE: You may disable in-app-purchases on your device using the Settings application.